Though summer is just about here, we have had tons of rain over these past few weeks really dampening (pun intended) the beginning of summer excitement. Hopefully things begin to turn around and we can begin to enjoy the sun again. I wore the above dress on a semi-sunny day this past weekend and love the flattering hi/lo hem and slim fit. Highly recommend this for any summer events you may have! Here are all my recent finds and the last one are 3 TV shows that instantly captured my attention and I had to watch every single episode. 1. Collagen peptides are great for the skin, hair, nails, bone and joint health, etc and I usually buy my Vital Proteins on Amazon, but Nordstrom has begun selling them too! This one is next on my list to try. 2. Chanel launched a ton of new cleansers and while I have never gotten that excited about Chanel skincare, I am excited about this. This one, this one and this one are the 3 that interest me the most. 3. I was at my girlfriend's house last weekend helping her shop for an upcoming vacation, and she mentioned that this strapless bra is amazing! I instantly added it to my cart. Fingers crossed that it's as good as the reviews say. 4. 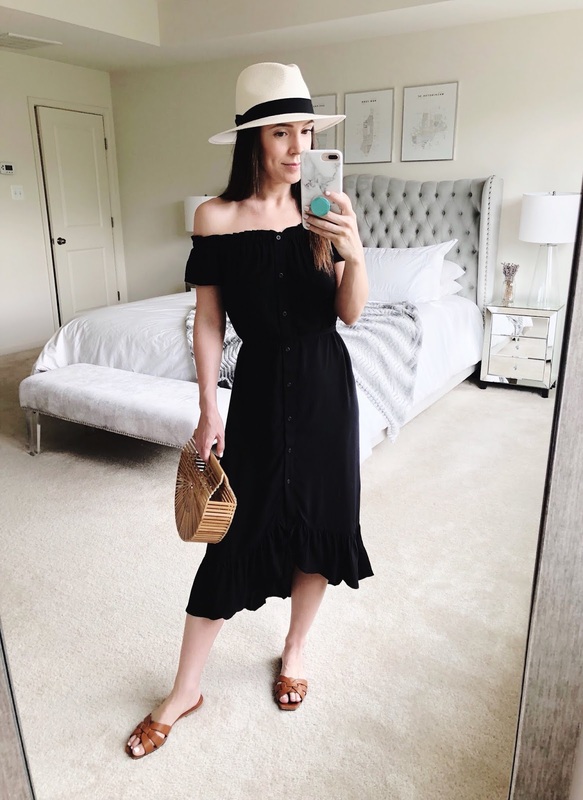 This maxi dress from Target may be one of the best looking dresses I've seen all season! It comes in a gorgeous royal blue as well, but I prefer the floral print. 5. These bejeweled sandals are the perfect way to add a bit of glam to a casual outfit (I just ordered them!). 6. Nothing makes me more motivated to work out than cute workout pieces, and these sneakers are on my wish list. 7. Soooo many of you have recommended this mascara to me and told me it's your holy grail (and it's only $5!) - and I just placed an order for it today (as well as this one - I'm going to test both). My lashes are excited to test it out! 8. There seems to be a new bronzer/blush/highlight palette launched every day and many times I simply overlook them but this one instantly caught my eye! I am already crazy about their bronzer which I wear almost every day, so I may need to snag this palette too. 9. Now that my skin is a bit more combination again, I forgot how much I loved this mattifying SPF lotion. It acts as the most amazing makeup primer and helps my skin not get as shiny throughout the day. 10. I go through phases of watching TV series on Netflix and Hulu, sometimes I find a ton of shows I like and watch every episode. Other times I can't find anything I want to watch. However, I recently found 3 series that got me instantly hooked and I watched straight through! I enjoyed all of them immensely but all tackle difficult issues and can be emotional to watch to be quite honest. The two on Netflix were Seven Seconds and 13 Reasons Why (Season 2 - I already saw Season 1 and loved it) and then on Hulu I watched The Handmaid's Tale. Surprisingly I didn't like The Handmaid's Tale book and found it difficult to get through, but I am much more interested in the TV series. Any new shows that you are currently enjoying that I should watch? Let me know! To read all my past Friday Finds' posts, click here. Hi! I just finished watching Seven Seconds as well! Riveting and heart wrenching -- as mothers, we can totally empathize with their grief. I just finished watching an older movie on Netflix Canada called The Wave (a Norwegian Disaster movie). I'm not into rock'em sock'em movies but this one is really well done and INTENSE!! Also, just have to say, I totally love your blog posts! It's so much fun to discover all of your finds along with you. I just noticed that the Self Portrait one shouldered dress that's on your wish list is on sale at Matchesfashion.com in Britain. It's selling for $237USD. They have all sizes at the moment so you should check out if it's worth ordering from them. ooooh I'm headed there now to look at it!!! !